This is the display of a bespoke cake supplier in West St., Dunstable, Bedfordshire, UK. 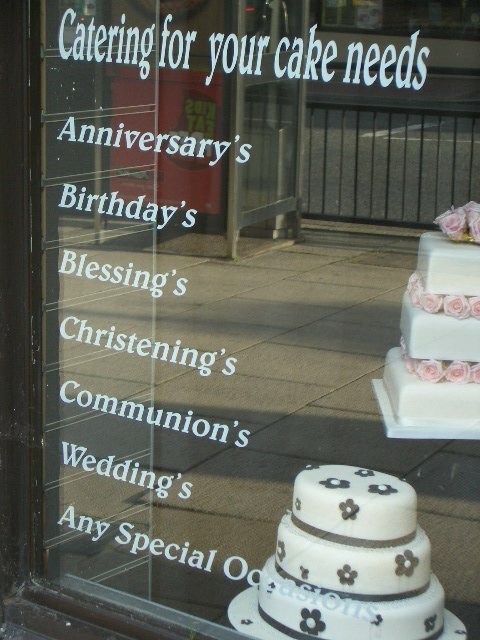 Why do all the plurals suffer apostrophe abuse EXCEPT the words “needs” and “occasions” (bottom line)? You’ve gotta love the inconsistency ! The rule seems pretty clear. If it’s a single word, you use an apostrophe for a plural. If it’s part of a clause or sentence, no apostrophe. Duh.